History, it’s said, is written by the victors. If that’s true, then Ford will be releasing volume and volume of automotive history texts thanks to the long-standing dominance it has shown over its automotive rivals – not the least of which is Chevrolet. Ford versus Chevrolet has been an intriguing and exhilarating rivalry to watch over the years, especially when the trucks of the two companies are in the spotlight, but it’s also long been becoming more and more of a one-sided affair over the last decade or so. 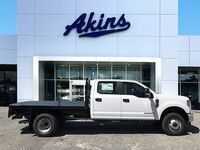 That’s because models like the new Ford F-350 Super Duty keep pulling further and further away from their Chevy counterparts – something you’ll quickly learn right here with this 2019 Ford F-350 Super Duty versus 2018 Chevy Silverado 3500 head-to-head heavy-duty truck comparison. 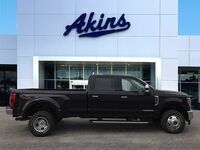 385 HP & 430 lb-ft. Standard Horsepower & Torque Ratings 360 HP & 380 lb-ft.
450 HP & 935 lb-ft. Diesel Horsepower & Torque Ratings 445 HP & 910 lb-ft.
Power and capability are the two features most important to people searching for a new heavy-duty pickup truck, so those are the things we’re going to focus on here as we compare the 2019 Ford F-350 Super Duty lineup to the 2018 Chevrolet Silverado 3500 lineup. 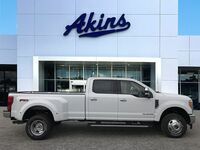 As outlined in our comparison table above, the 2019 Ford F-350 Super Duty lineup features higher standard horsepower and torque ratings and higher diesel horsepower and torque ratings than the 2018 Chevy Silverado 3500 lineup. And those power advantages equate to higher capability ratings for the 2019 F-350 Super Duty lineup. 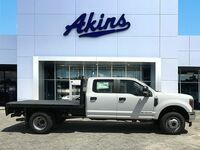 More specifically, the 2019 F-350 Super Duty lineup can tow more and haul more than the 2018 Silverado 3500 lineup – the specifics of which you can see in the table. 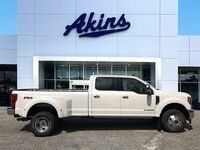 For more on the 2019 Ford F-350 Super Duty lineup, please contact our staff here at Akins Ford near Atlanta, GA. 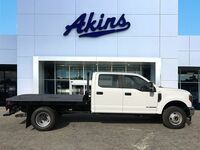 Interested in a Ford Super Duty F-350 DRW?